Climate change denial: James Delingpole tells it like it isn’t. 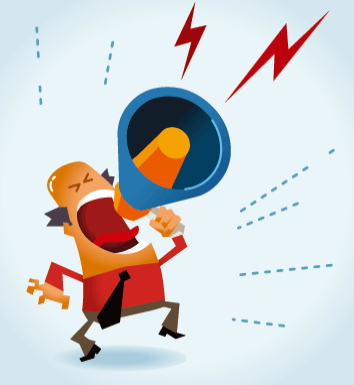 As I predicted, with the advent of the Intergovernmental Panel on Climate Change report due tomorrow, the noise machine is out in full force. Still, when I saw that James Delingpole had written yet another climate change denial piece for The Telegraph, I dithered. After all, in my opinion Delingpole is one of the noisiest of the deniers, saying whatever he can no matter how provocative, presumably to get a rise out of his readers. You can read all about his shenanigans at DeSmogBlog. But The Telegraph is widely read, and Delingpole’s wrongness is the usual kind of stuff that will make the rounds of the deny-o-sphere, so I’ll stick my head in to the maelstrom momentarily. At the heart of the problem lie the computer models which, for 25 years, have formed the basis for the IPCC’s scaremongering: they predicted runaway global warming, when the real rise in temperatures has been much more modest. So modest, indeed, that it has fallen outside the lowest parameters of the IPCC’s prediction range. The computer models, in short, are bunk. Actually, no. They didn’t predict “runaway” warming, they use models of the atmosphere checked against real measurements to make predictions of future temperatures. The warming predicted was steady and unsettling, but hardly “runaway”. Delingpole’s use of the term is a strawman. Next, the real rise in temperatures has not fallen outside “the lowest parameters” (he means lowest range) of the predictions. Models use different input information to predict what temperatures will be like. Some have finer time resolution, some will have better modeling of various factors, some make different assumptions than others, and so they produce different (though generally very similar) outputs. When taken together, they provide a range of predictions, and while current land and sea surface temperatures are lower than the most likely prediction, they are still within the range of predictions the models have given. While the recent temperatures have flattened due to cooler ocean surface temperatures, the overall trend is pretty obvious. It’s true that temperatures have flattened out over the past decade or so, but this doesn’t mean global warming has stopped, that we’re cooling, or the models need to be thrown out. Quite the opposite, which I’ll show in a moment. And finally, no, the models aren’t “bunk”. In fact the models are doing a pretty good job of representing the physical nature of what’s going on. The real problem isn’t with the models, it’s with people interpreting them, or, more accurately, misinterpreting them. Again, I’ll cover this below. 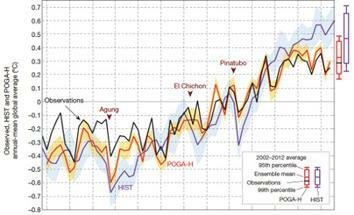 This is why the latest Assessment Report is proving such a headache to the IPCC. It’s the first in its history to admit what its critics have said for years: global warming did “pause” unexpectedly in 1998 and shows no sign of resuming. And, other than an ad hoc new theory about the missing heat having been absorbed by the deep ocean, it cannot come up with a convincing explanation why. The model which includes the measured cooler ocean water (red) follows the measured land and sea surface temperature flattening (black) quite well. Without it (purple) the flattening seems more anomalous. Click for more info. Graph by Kosaka and Xie, via The Guardian. The idea that the missing heat is being absorbed by the deep ocean is hardly ad hoc. It’s observed. And it’s hardly “new”; we’ve known the deep ocean has been heating up for a while. This is also happening at the same time that we’re seeing relatively cooler surface temperatures in the Pacific ocean, which cools the air. That’s part of a natural cycle, with ocean surface temperatures going up and down over time. For the moment, that effect is greater than the overall warming trend of surface temperatures, so we see a flattening. And despite Delingpole simply dismissing this idea, recent computer models which incorporate the cooler Pacific waters have been able to reproduce this temperature flattening effect pretty well, too (shown in the inset graph), strengthening our understand of how the ocean affects land surface temperatures. When we cycle back into warmer surface temperatures, the land surface temperature will go back up. We’ve seen this happen before, over and again in the past. You have to be careful not to make any long-term claims about that either; scientists are careful to average over both cooler and warmer cycles to look at the overall trend. Denialists love short-term trends, because they can cherry-pick them to make it look like temperatures are stable or even dropping, when in reality the overall trend is up, up, up. So the computer models aren’t “bunk”, as Delingpole claims. They’re pretty good, and our best bet for figuring out what’s going on. They get better at doing so over time, too. This latest report is hardly a “headache” for the IPCC, but since they’re ramping up the rhetoric so much it’s obviously a thorn in the side of deniers. Who, I suppose, are a headache for the IPCC. And I’ll remind you that while denialists are distracting everyone about the “pause”, about climate sensitivity, and all that, the Arctic sea ice is melting. Antarctic land ice is melting. We just experienced the hottest decade on record. 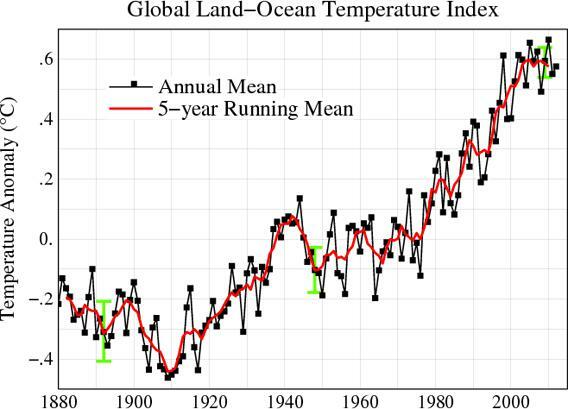 And it’s difficult to stress this enough: The trend over time is higher temperatures. I could go on; Delingpole’s article is a rich source of the same tiresome anti-reality claims. But as usual, when you dig even a tiny bit into things like this, the denials fall apart. I suggest you keep your browsers pointed to locations of good information, like Skeptical Science, Dana Nuccitelli and John Abraham’s column called “Climate Consensus-the 97%” in The Guardian, and follow real climate scientist Michael Mann on Twitter. And not that I’m looking forward to this, but eventually the ocean cycle will switch back to warming, and land surface temperatures will once again begin their inexorable climb. What will the deniers say then? I can guess: They’ll forget all about this “pause”, and focus on some other cherry-picked event to muddy the waters. They are as predictable as, well, the climate. Tip o’ the thermometer to Brandon Rhea on Twitter.